One of the things that Midtown is known for is upscale dining. In this part of town, you can find upscale Steak houses and Japanese/Sushi Restaurants. Unfortunately, they come with a high price. What if you could find an upscale restaurant at Downtown prices? Your prayers have been answered…. 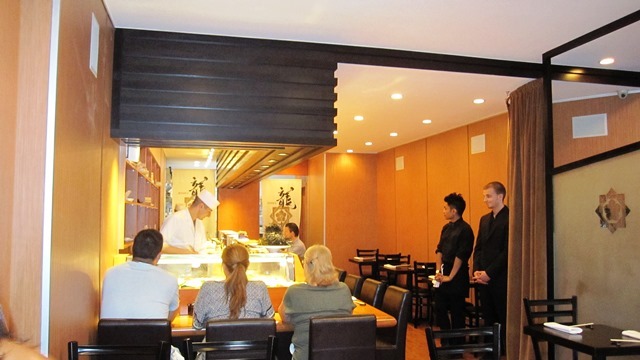 Sushi Dojo is an intimate Japanese/Sushi Restaurant in the heart of the East Village. They feature quality grade seafood that won’t liquidate your bank account. It is above our $25 and under mantra, but you can strategically make it work. After all, a splurge every now and then is OK…right? We visited this spot a few weeks ago for a “Girls Night Out.” We were immediately greeted with smiles and seated at a window table, with a birds eve view of the restaurant. Our server educated us on their menu and the “Sake Guru” gave us a condensed Sake class. Based on the answers we gave him, he brought out a few Sakes to sample. We made our choice, and the evening began. Our feast began with Miso Soup. My friends ordered the typical Miso Soup, but I decided to try their Red Miso Soup. The broth was a brick red color with a small clam floating in the center. I took a sip and let out a “Mmmmm” immediately. It was rich and warm without being salty. It warmed my throat and my belly, like a giant hug. Before I knew it, we were all eating my soup. I’ve never had Red Miso soup before, but now I’m hooked. Why don’t more restaurants offer it? SO much better than your standard Miso Soup. Next up Kaki Age. What is Kaki Age you ask? 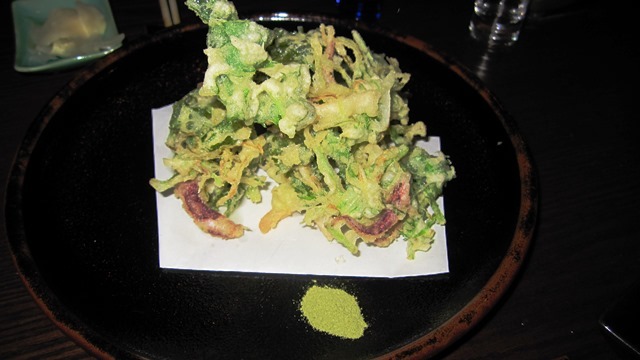 4 words…….”Heaven on a plate.” It’s deep fried seasonal vegetables and seafood, in a tempura batter. It was light, crunchy and not greasy at all. What makes this dish so special, is the green tea dipping salt. Once you dip your nibble in this salt, it takes the flavor to the next level. OUTSTANDING!!! We loved it so much, we ordered two. Afterwards we feasted on an assortment of Sushi and Sashimi. The fish melted in our mouth or as I like to say; “Like Budda.” It was so fresh, it tasted like the sea. And course our “Sake Guru” kept us happy with his assortment. Wish I wrote down the names of what we drank. DARN!!! And a little above too….. This entry was posted by Rosemarie on Friday, July 12th, 2013 at 8:23 am	and is filed under Asian, East Village, Japanese/Sushi, Manhattan. You can follow any responses to this entry through the RSS 2.0 feed. You can leave a response, or trackback from your own site.